How full is your gas tank right now? Let me tell you a little story about me in a past life. Well, okay, it was only about 8 years ago, but I’ve learned a lot since then. We live in an area where the nearest decent shopping is 45 miles away. So shopping is an ordeal, and the best time to go is when the majority of the children are in school or somewhere else. So one day I went shopping with my toddler while my two older kids were off at school. About half way home, the car just quit running! Right in the middle of driving! So I coasted down the hill and pulled off on a wide area in front of a LONG driveway that led to the only house in sight–a cute little farm house with sheep and horses. Toddler’s sleeping in the car seat in back, and I’m in a time crunch here–the other kids won’t be in school all day! I’m not a mechanic, so I have no idea what’s going on, but there’s movement out at the farm. So I pull the sleeping toddler out of the seat and start hiking down the driveway. A sweet older gentleman and his wife meet me near the house and drive me back out to my car to figure out what is wrong. Well, after a little figuring, it turns out I was just out of gas. The tank was low when I left my house, and in the hustle of getting the shopping done, I had forgotten to fill up before leaving town. Thankfully, a gas station was only a couple more miles down the road, so he went and filled a gas can, gassed my car up, and I was on my way. He wouldn’t even let me pay him. So embarrassing! But at least I wouldn’t be seeing them anywhere again. Or so I thought. It turns out they are quite active politically in the area, and so am I, so the next county convention I went to, there they were. He comes up to me and asks if I’ve run out of gas lately. Umm, no. I save that for special occasions. Then she found me later and called him over (not quietly) saying, “Look dear, it’s the girl from the highway!” Yep, that’s me, the girl from the highway. Now, I had already known it was a good idea to keep your gas tank from falling below the half way mark, I just hadn’t put it into practice in my own real life. 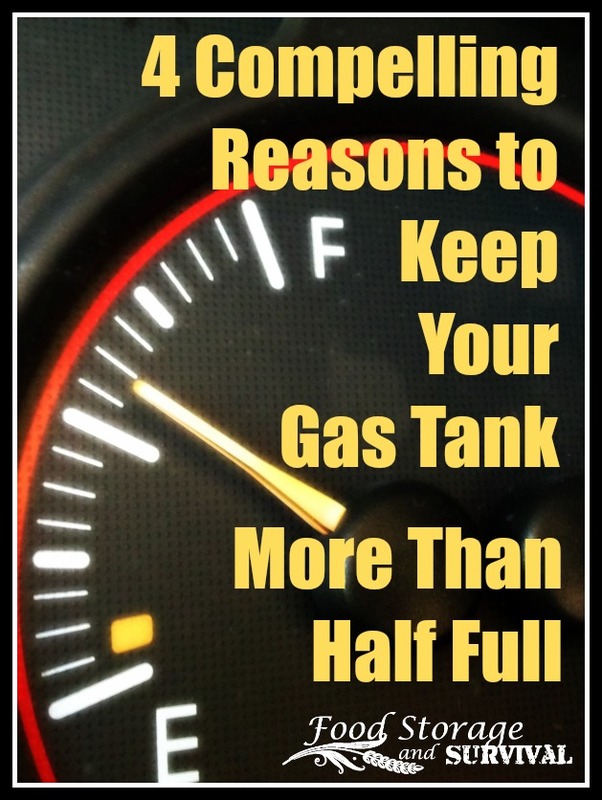 Now I do a much better job at keeping my tank over half full, and here are four reasons why you should, too! 1. Reduced sticker shock. Yes, this is all psychological. You are using the same amount of fuel whether you fill up more often or wait until you’re completely empty. But it’s so nice to leave the gas station having spent under $30 to fill up my gas tank! 2. You won’t run out of gas. This one is obvious, but running out of gas is a hassle! It takes time, makes you an easier victim, and usually requires outside help to get you back on the road. You might even save yourself from being known as “the girl from the highway”! 3. You’re ready to leave at a moment’s notice. Where we live, we drive for pretty much everything. There have been plenty of times prior to the half tank fill up routine that we hopped in the car, barely in time to get to whatever appointment we were headed to, and had to stop for gas so we could get there. Having gas in your tank could be especially helpful if you had to evacuate quickly! Which leads into #4 . . .
4. You can get farther than the local gas station. How far can you drive on a half a tank of gas? My van will go about 200 miles. Find yourself a bug out location or at least a safe zone within that distance from your home. Ideally, if traffic is good, you will be able to reach your destination any time, day or night, without a stop at a gas station because you have half a tank of gas or more in your vehicle all the time. And wouldn’t it be nice to get there without having to hike in? So here’s your self check. Where’s your gas gauge at right now? If you’re below half, do yourself a favor and fill that sucker up today. You’ll be glad you did. Glad to read your story ;) It also helps prolong the life of your fuel pump! Half a tank of gas is always a good idea but what about a spare container of gas too As long as you change it from time to time to keep it fresh.That way you have it for your van or anything else you might need,like to help start a fire or for gas powered tools after a storm. I’m always telling my teenager this exact thing. I agree that it is important to be prepared, especially if you are like me and always running late to appointments and don’t have time to stop for gas. What are your thoughts about having a spare container of gas, like Bob recommends? I’d carry a spare container of gas if I had a truck and could put it in the back in the open air. 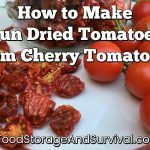 Then keep it fresh by using it and refilling at every fill up. Not really interested in the stink or potential safety problems from having a container of fuel in the back of my minivan full of kids though. Just my opinion.